The Otago Infantry Regiment was one of four regional infantry groupings (along with Auckland, Wellington, and Canterbury) which made up the bulk of New Zealand’s infantry forces during the First World War. It served as the Otago Battalion at Gallipoli in 1915 before being divided into 1 Otago Infantry Battalion and 2 Otago Infantry Battalion in March 1916. An additional battalion, 3 Otago Infantry Battalion, existed between March 1917 and February 1918. The regiment served on the Western Front from 1916 until 1918. Cloth patches for the (l to r) 1st, 2nd and 3rd Battalions of the Otago Infantry Regiment. Cloth patches sewn on the backs of uniform jackets from October 1916 identified which unit – or part of a unit – an individual belonged to. These are the patches of the three Otago battalions serving on the Western Front. A fourth (reserve) battalion was based at Sling Camp in England. 4th (Otago) Company. Cap and collar badges: A kiwi flanked by fern fronds surmounted by ‘South Africa 1901-02’ and ‘4th Otago Regt’. 8th (Southland) Company. Cap and collar badges: A Maori warrior grasping a taiaha. Motto: Kia mate toa (Fight unto death). 10th (North Otago) Company. Cap badge: A shield with the Southern Cross (four stars) flanked by fern fronds and surmounted by a crown with the motto on a scroll below. Collar badges: Similar to the cap badge but without the fern-wreath. Motto: Kia toa (Be brave). 14th (South) Otago Company. Cap badge: The regimental number XIV within a wreath of the red rose, shamrock and thistle, surmounted by kea and above the motto. Collar badges: Kea within a wreath of the red rose, shamrock and thistle, above the regimental motto. Motto: Ake kia kaha (Forever be strong). The Otago Battalion was divided into 1st Otago Battalion and 2nd Otago Battalion in March 1916, with the second battalion made up of a new set of companies with the same names as the first. A third battalion, the 3rd Otago Battalion, existed from March 1917 till February 1918. The Otago units drew their recruits from the Otago military district, which encompassed the Otago and Southland regions. Each regional infantry company had its own distinctive cap and collar badges (the cap badge is shown in the centre of each photo). 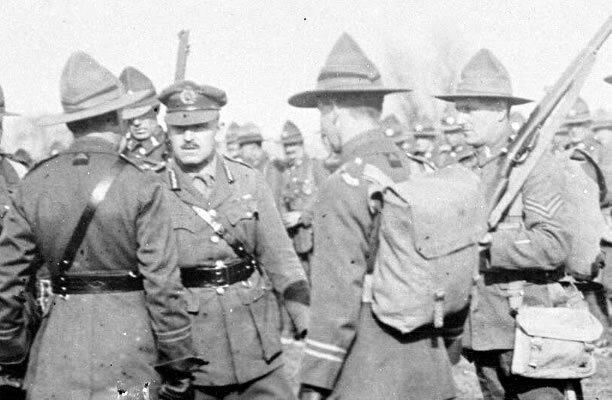 They continued to be worn by the Otago companies after the second and third battalions were formed, with cloth patches signifying which battalion they belonged to. We have 19 biographies, 40 articles, 1 comment related to Infantry units. What I would like to know if an uncle of mine, Henry Dobson of Island Cliff in North Otago, served in the NZ Forces during WW1. I know his brothers, Andrew Dobson, my father, and 2 other uncles William Dobson and Thomas Dobson, all of Island Cliff in North Otago served during WW1 but I don't know about Uncle Henry. Could someone please tell me who to ask? I would be most grateful.